The Stampin' Up! hostess set "God's Beauty" is used here to make these two lovely cards. 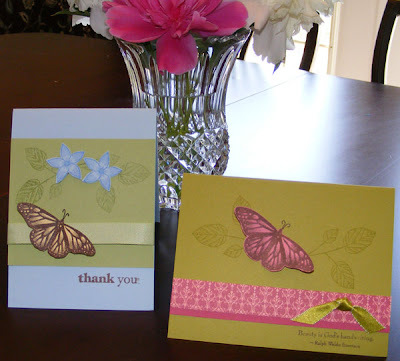 The thank you on the left was one of the cards at our All Occasion Stamp-a-Stack on Monday night. We cut the butterfly out completely and then drew in the antennae with a brown pen. It is much easier and nicer looking than trying to cut around the antennae. Also we stamped the butterfly on colored cardstock so we didn't have to color it in - a little quicker way to work with this image. "Beauty is in God's handwriting" is the stamped message on the Kiwi Kiss card on the right. I used some Raspberry Tart designer paper to accent this card. This month, designer paper and 12x12 textured paper packs are buy 3 get one free! When I cropped this photo, I just had to leave that bit of pink peony peeking in at the top. My dear husband dug up some of the plants my Mother didn't want, divided them and planted in our flower garden last fall. We are getting a marvelous showing this spring of both white and that dark fushia pink.